This book examines the global regulation of biodiversity politics through the UN UNConvention on Biological Diversity (CBD), the WTO and other international treaties. 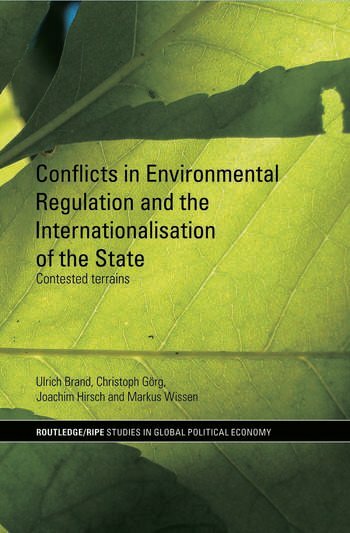 Using historical-materialist state and regulation theory, it assesses how the discourse and politics of sustainable development have contributed to the internationalisation of the state. enforcement of intellectual property rights and their impact on biodiversity. This book will be of interest to students and scholars of international politics, international political economy, environmental studies, development studies and political ecology. Ulrich Brand is Professor of International Politics at Vienna University, Austria. Christoph Görg is a Senior Researcher at the Helmholtz Centre for Environmental Research-UFZ in Leipzig, Germany. Joachim Hirsch is Emeritus Professor in the Department of Social Sciences, University of Frankfurt, Germany. Markus Wissen is Assistant Professor of the Institute for Political Science at Vienna University, Austria.